Use these pivot table styles macros to list all pivot tables, with their style info, or list custom and built-in stles. Also, use macros to list default styles for the active workbook, or change them. 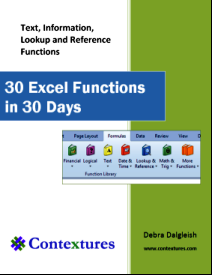 Download the sample workbook with macros. Use this macro to create a list of all the pivot tables in the active workbook, with information on the pivot table style applied to each one. 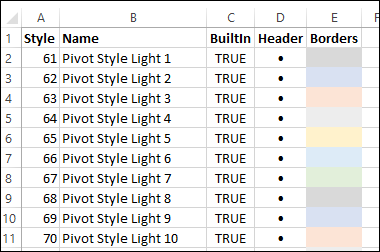 This macro shows the sheet, pivot table name, pivot table address, style name, BuiltIn (False if Custom), and the header, Row Subheading 1, and inside border colours. This macro is in the sample workbook that you can download. Or, to use the macro in your own workbook, copy it to a regular code module. The macro adds a sheet to the workbook, with the a list of the pivot tables and their style settings..
.Range("J1").Value = "• = Black"
Use this macro to create a list of all the pivot table styles in the active workbook. This macro shows the style name and number, BuiltIn (False for Custom styles), and the header and inside border colours. The macro adds a sheet to the workbook, with a list of the pivot table style settings. .Range("G1").Value = "• = Black"
Use this macro to create a list of all the custom pivot table styles in the active workbook. This macro shows two of the pivot table style settings, and you could modify the macro , to list more of the setttings. This macro is in the sample file that you can download. Or, to use the macro in your own workbook, copy it to a regular code module. 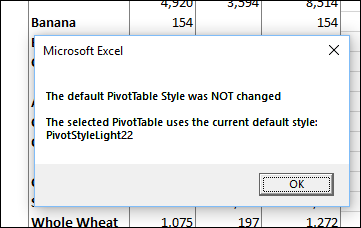 MsgBox "No custom pivot table styles"
.Range("E1").Value = "• = Black"
When you create a pivot table, a default PivotTable Style is automatically applied. 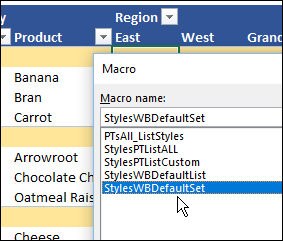 To see the names of the default pivot table style, and the default table style, run the following macro. The macro adds a sheet to the workbook, with the a list of the default styles. If you create a custom style, or apply one of the built-in pivot table styles, you might want to use that as the default pivot table style for the workbook. 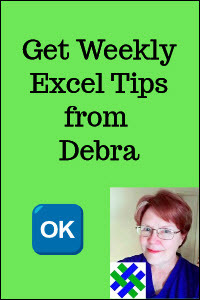 Select a cell in the formatted pivot table, then run this macro, to make that the default style for the workbook. The macro changes the default pivot table style for the workbook, based on the pivot table style for the selected pivot table. If the pivot table style is the current default style, a message will tell you that. copy the formatting from one pivot table, and apply it to another pivot table.